A New Angle on Trump and the Alt-Right: Magick! Within the concentric circles of Trump’s regime lies an unseen culture of occultists, power-seekers, and mind-magicians whose influence is on the rise. In this unparalleled account, historian Gary Lachman examines the influence of occult and esoteric philosophy on the unexpected rise of the alt-right. Did positive thinking and mental science help put Donald Trump in the White House? And are there any other hidden powers of the mind and thought at work in today’s world politics? 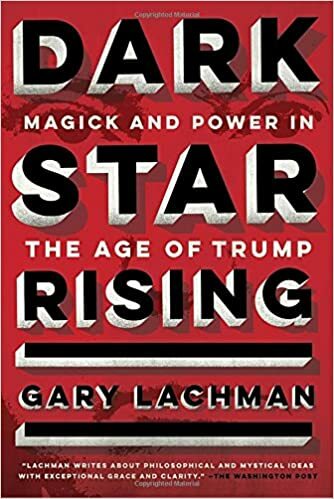 In Dark Star Rising: Magick and Power in the Age of Trump, historian and cultural critic Gary Lachman takes a close look at the various magical and esoteric ideas that are impacting political events across the globe. From New Thought and Chaos Magick to the far-right esotericism of Julius Evola and the Traditionalists, Lachman follows a trail of mystic clues that involve, among others, Norman Vincent Peale, domineering gurus and demagogues, Ayn Rand, Pepe the Frog, Rene Schwaller de Lubicz, synarchy, the Alt-Right, meme magic, and Vladimir Putin and his postmodern Rasputin. Come take a drop down the rabbit hole of occult politics in the twenty-first century and find out the post-truths and alternative facts surrounding the 45th President of the United States with one of the leading writers on esotericism and its influence on modern culture. Oddly, this isn’t, by the way, an utterly deranged perspective on the tradition Trump was brought up in, that of Norman Vincent Peale’s Power of Positive Thinking. Trump attended Peale’s services as a boy and was married to Ivana by Peale. Peale was considered very conventional socially. But that’s mostly because America has had a religion of practical success going way back.